Spring Break is almost here and i know everyone needs good snacks in order to have a good time. 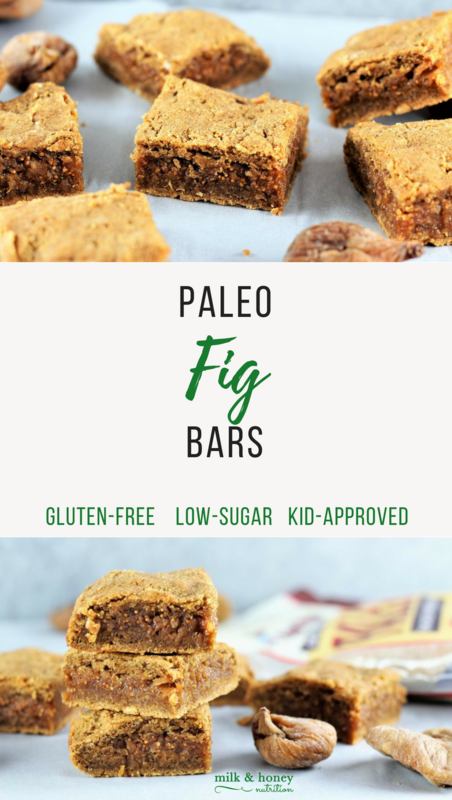 These Paleo Fig Bars are made with real food ingredients that kids and adults alike will love. AND, making them is a great opportunity to get the kids in the kitchen with you! Line a loaf pan with parchment paper. Pre-heat your oven to 350 degrees. To make the filling: Next, boil the figs in a small saucepan with just enough water to cover them for 5-10 minutes. Remove the figs from the heat and drain the water. Add the figs to a food processor and process until smooth. Spread the fig mixture over the crust in the loaf pan, leaving a small edge bare all the way around the edges. Spread the second half of the crust mixture over the filling. (Tip: do small pieces at a time, using wet fingers to flatten the dough, and then place the pieces on top of the fig mixture.) Gently press the dough edges together to seal the fig mixture inside. Bake for 25 minutes. Immediately, lift the fig bars out of the pan using the parchment paper and place on a wire rack. Carefully, using a wide/flat spatula, slide the parchment paper out from under the bars. Let the bars cool completely before slicing. Enjoy!